My favorite crafting happens in the kitchen, calls for lovely things like butter, sugar and chocolate, and ends up in my mouth. Unfortunately, that sort of crafting is probably not what the other 3 moms had in mind when we agreed on this topic. In fact, I’m pretty sure it’s not, because we’re covering that sort of crafting next week. No, I’m pretty sure we are talking about inedible crafts right now. Are you a crafty mom? 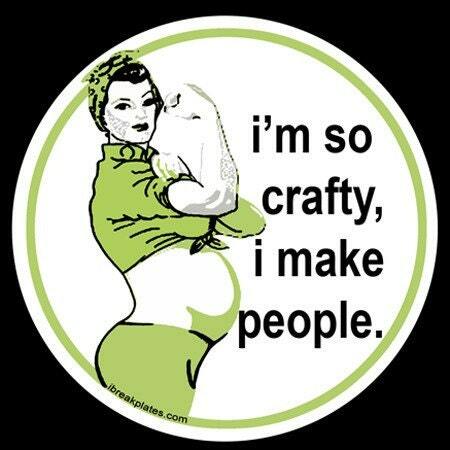 I used to want a t-shirt that said, “I’m so crafty I make people,” but I’m afraid it would be misleading. Sometimes I think babies are the only project I ever finish – or even start. But I’m trying to do better. I now own spray paint in two colors, and I have used both. But my new craftiness doesn’t end there. My new-to-me bedframe has drawers built into it, and one of the drawers on my side holds actual crafting supplies! I have scissors, tacky glue, glue sticks, construction paper, a few stencils, bottles of acrylic paint in Christmas colors, and 2 varieties of Mod Podge. Yes, now I have your attention. Now you know I’m serious. But even though I really am serious, I have to confess that my Mod Podge stash has only been used for one craft so far. It’s simple but cool and turned out amazing, but I can’t show you because the intended recipient reads this blog. And, well, I didn’t do the actual crafting, although I did help a little. That counts, right? So far the only other Christmas crafting we have done is making Christmas cards. See? All of the girls down to Becca worked on these. They thought about initialing the back of each creation, but then decided that they would only do that on the ones they really liked. If they weren’t entirely happy with one, they decided to sign someone else’s initial instead. 😉 And since we have so much time and effort in them already, I’m almost positive we’ll actually mail them this time! I can use what’s left of the 100 Christmas stamps I bought last year. I think I have 100 left. But I have spent a few minutes several hours a little time on Pinterest, and I hope to do more crafts this year than we have in the past. It shouldn’t be hard, since we’ve already done two and I think that may tie with our previous record of two. If our Clementine Candle counts, we’ve already done three and we’re in record territory. Not our photo, but it’s easy and beautiful. Kaitlyn managed to peel her clementine with half of the skin plus the inner part of the stem intact. She just poured in a little olive oil and lit the tip of the stem. It was gorgeous! These paper ornaments would be a snap to assemble. I love that little kids could help with something that looks this classy. Of course we could vary the colors: red & white are what we use to decorate for Christmas. Then we could replace the red with gray for a more wintry feel and leave them up until spring! Since the girls are always bringing home clearance tea cups from Vison Forum, I think we should try some of these teacup candles as gifts. We would need to buy wicks from Hobby Lobby and 1 or 2 big cheap candles from a dollar store. Then we can color them with leftover bits of used candles, and scent with a few drops of essential oils. If we do our own cards again next year, I think it would be a lot of fun to try pop-up Christmas cards like these. A web search would turn up other pop-up ideas for Christmas cards. And even though we would be starting late, I want to do an Advent calendar of some sort. Do you have a suggestion for one we could do with very little preparation? I have friends who have 25 candles, and each night when they do their Advent reading they light an additional candle, i.e. one on the first night, two on the second night, until they finally light all 25 candles at once. Are you a crafting wannabe, or a guru? What’s being crafted in your corner? What do you hope to try someday soon? Link up with us and share your ideas or intentions! Your post must be family friendly. Link to a specific relevant post, not to the homepage of your blog. Your post must include a link to at least one of the 4 Moms. If your link is deleted, you probably didn’t follow these rules. We hope you’ll fix the problem and try again! If you don’t know why your link was deleted, just ask. November 29 – 4 Moms Q&A: Christmas in the Coghlan house, etc. Thank you for the post…..it has got me all geared up for crafts!! What a great attitude, Amy! I’ve reached that point with gardening, although it certainly doesn’t mean I’ll never try. I just know it’s not my strong point and have decided not to feel guilty about it. “My favorite crafting happens in the kitchen, calls for lovely things like butter, sugar and chocolate, and ends up in my mouth.” That is me exactly. The bulk of my creativity goes into baking/cooking, trying new recipes, tweaking existing ones, etc. I love crafting, but sometimes it can get pricey. I love that your kids made those cards! At some point I want to start sending out cards again, but no luck this year, just ran out of time and triing to not stress out.